The route begins near the bus station and the Stalowa Wola Centrum railway station. We take Okulickiego street, and go towards the intersection with Popiełuszki street. Then we turn into Wolności street, to see the first location included in the Route: the former office worker housing estate. On foot – total walking time: 80 min. By bike – total riding time: 27 min. 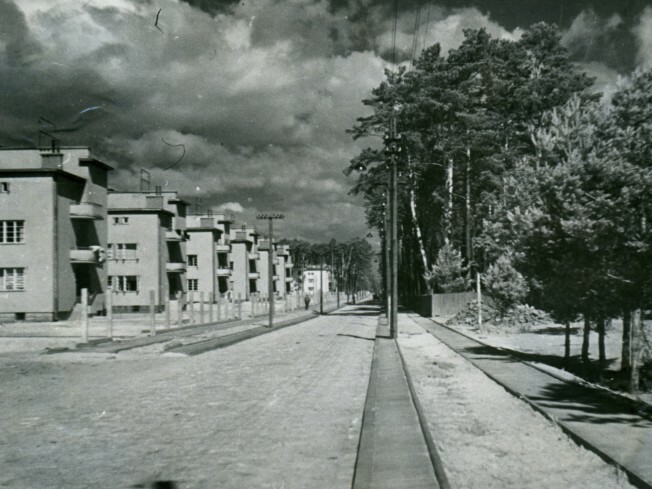 The housing estates included in the Trail were built to cater for the needs of the Southern Plant in Stalowa Wola, which was the largest undertaking in the Central Industrial Region. The construction progressed in the atmosphere of fascination with the capabilities of Polish industry, and appropriate completion of the consecutive stages of the construction work was supervised by the highest Polish authorities. Stalowa Wola became an epitome of national success and pride. A large-scale project required proficient logistics and planning. Hence, an indispensable requirement was to build a housing estate for the numerous workers to be employed in the new plant. The price tag of the residential complex was huge – the cost of the land itself was 4.2 million zlotys, while the total cost exceeded 26 million zlotys. The work on what was initially named the ‘Housing Estate of the Military Residential Fund at the Southern Plant in Nisko’ began in the spring of 1937. The land for development, previously covered with a pine forest, had a favourable location, 9 km from Nisko and 3.5 km from Rozwadów. The road that linked these localities, as well as a railway line, were close by. That barren land was put to good use by Bronisław Rudziński, in collaboration with Jan Bitny-Szlachta and Michał Panas. The architects based their designs on those prepared for other Central Industrial Region facilities, but they did it creatively, adding their own touch. Their buildings show flagship Functionalist solutions, such as shape merging, the use of stairwells vertical windows to break the longitudinal rows of windows, the application of colour to accentuate the base course, the use of flat roofs, etc. They also introduced other eye-catching features to make the architectural style of Stalowa Wola distinctive and unique when compared to other developments within the CIR project. Although the pace of work was fast, the solutions implemented were good quality, with a focus on detail, functionality, as well as an individual touch. Today, we can still see here some very-well designed fences and railings, small architectural forms, as well as such every-day use items as letterboxes or the frames for number on the building walls. The interiors have retained their pre-World-War-II atmosphere, evoked by the curved balustrades, the fancifully arranged floor tile motifs on the stairway landings, as well as period door handles. Attention was paid not only to common areas, such as stairwells, but also to the neat finish of the flats, with the use of high-quality materials, and both good-looking and functional furniture. 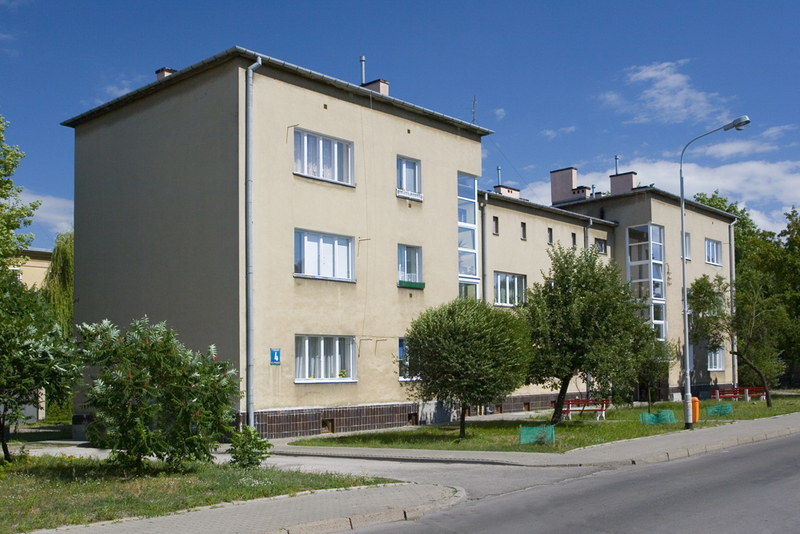 The former housing estate for office workers (Wolności and Skoczyńskiego streets) was financed by the Social Insurance Office funds. Four two-stairwell residential buildings, of two types, were built, each for 16 families. Some flats had three rooms, a kitchen and a bathroom (today: 6 and 8 Wolności street). Others had one or two rooms (today: 6 and 8 Wolności street). There were also hotels for office workers: Hotel No. 1, with a casino and 33 single rooms, and Hotel No. 2, with 21 rooms and the shops for those plant employees who had to stay in Stalowa Wola for some time (today’s 7 and 9 Wolności street). In the adjacent street (today: Skoczyńskiego street), two identical elegant residences and six blocks (of four flats each) were built. Another site to visit is the Hutnik Hotel, which we approach along Narutowicza street – where four buildings with ten four-room flats and shops on the ground floor are located – and Prymasa Stefana Wyszyńskiego street. Here, at No. 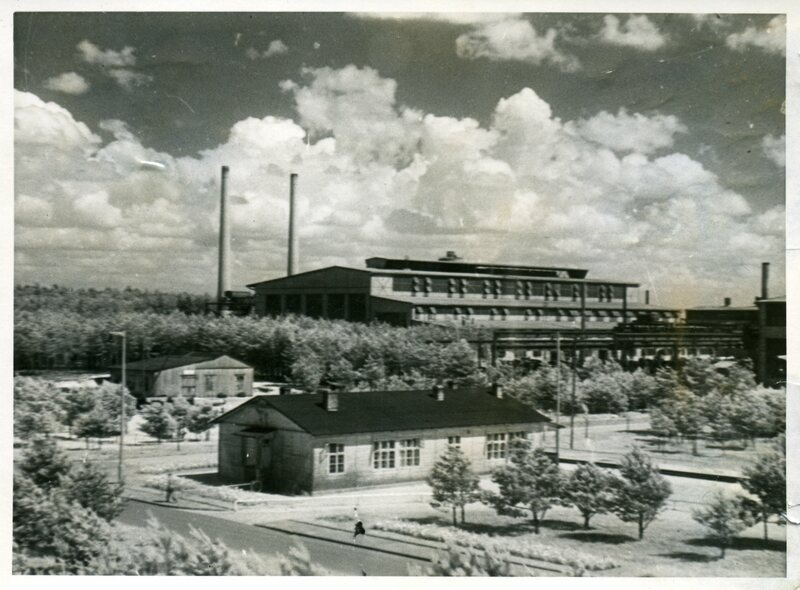 12, we can see the building which was the Guest House of the Southern Plant Management at the time of the Central Industrial Region. Designed to close the view corridors of the eastern part of the residential estate, probably by Jan Bitny-Szlachta, the hotel was placed with its front facing the west. According to the design, it was preceded by an oval forecourt. Inside, on two floors, there were 28 rooms, a restaurant, a dance room, club rooms, as well as a vast hall. The wing contained the hotel manager’s and the receptionists’ flats, as well as the garages for the guests. The floor plan showed an intersection of the main body of the building with two perpendicular side sections, facing the east. That was a fashionable solution at the time, which can be also seen in the community centre in the residential estate of the PZL plant in Mielec. The façade of the hotel was reminiscent of the solutions applied in the specialist staff’s houses. The prominent flat roof was supported by two-floor high rectangular pillars, which formed a rhythmic uniformed structure, toned down only in the main entrance area, marked with a protruding annexe of the club section. The modern shape of the building was emphasized by the glazing in the rounded corner of the dance room. The guest house was built, with no finish, from 1938 to 1939. During World War II, the Nazi German troops used the building as a grain warehouse. After the war, the director of the Stalowa Wola Steelworks made a decision to complete the construction according to the original plan. In January 1948, the building housed a canteen, a buffet and hotel rooms. It was there, at the Hutnik Hotel, that all the town jubilees, celebrations, etc., to which ministers or other state officials were invited ended at the Hutnik. An example of the menu of those olden days is: cabbage and mushroom pie with fish, beef stroganoff, Polish style pâtés, Polish style chicken or wild strawberries in whipped cream. In the 1960s and 1970s, the hotel was the venue of such famous balls, as the Hunters’ Balls, or the balls Polish Federation of Engineering Associations. Today, the building is considered as one of more interesting examples of the Art Deco style. Very popular during the two decades between the world wars, it combined modernity and functionalism with elegance and decorativeness. The Hutnik Hotel is listed as a heritage site, an example of Modernist architecture in the 2nd quarter of the 20th century. Various functional solutions were applied in the new residential estate for company office workers and management. The specialist staff’s company houses included, inter alia, blocks of flats comprising 4 three-room flats, with a kitchen, a bathroom and a servant room. On each floor there were two flats, of a usable area of 80 m2 each. The houses stood out against other Stalowa Wola developments due to their intriguing architectural form. The front elevations of the houses were marked with loggias disciplined by the regular rhythm of the pillars, whereas the façade symmetries were shaped by very tall and narrow stairwell windows (Wyszyńskiego and Mickiewicza streets). The right proportions and the masterly designer intuition are evident from the elements emphasizing the verticality of the contours. 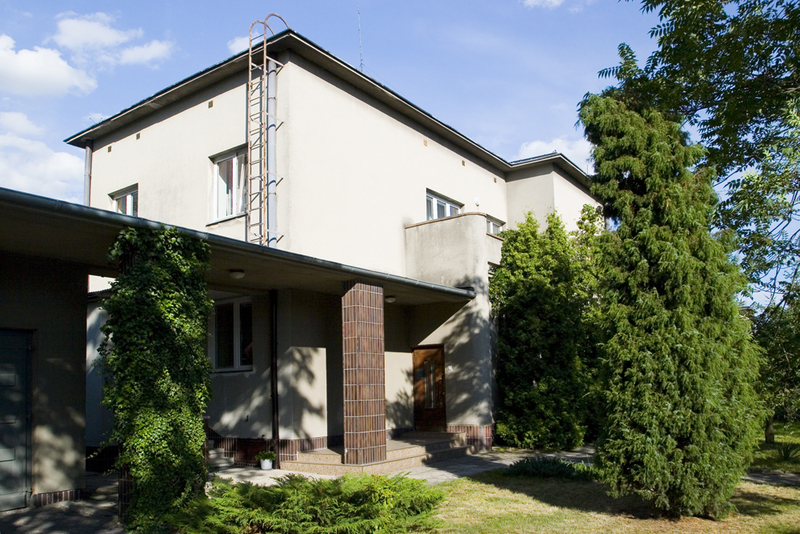 The buildings are among Poland’s few surviving examples of the solutions following the Vertical Modernist convention. Another site on the Route is the residential estate made of the directors’ houses (in Wyszyńskiego and Mickiewicza streets). It comprises 6 identical semi-detached four-room residences for senior officials (in Mickiewicza street), 5 five-room houses for department managers (in Wyszyńskiego street) and 2 exclusive villas: for the general director (with eight rooms) and his deputy (with six rooms), at 1 and 2 Wyszyńskiego street. Luxurious, impressive and eye-catching, all theses villas were located with their roof ridges parallel to the street. They were outlined as two-floor oblong cuboidal shapes, with a small avant-corps in the front. All of them were marked by the subdivision into a day and a night sections, so typical of that period. For example, there were 3 rooms downstairs, which could be accessed from the central hall. The rooms were arranged enfilade, and two of them had doors leading to the garden patio. There were also a kitchen, a bathroom and large servant quarters. The stairwell led upstairs, to a hall leading to a balcony, three bedrooms, a bathroom, and a dressing room. Two of the bedrooms had their own large terrace overlooking the garden. The striking architecture of the house drew attention due to the sculptural feel of the subdivisions in its uniformed shape, and the interplay of the terraces. An arcade, supported by three pillars, which linked the villa to the garage was another valuable visual motif, adding grace and beauty to the whole design. Now, we leave Wyszyńskiego street for Mickiewicza street, passing the edifice of the former secondary and grammar school (the latter was the first school to have been opened here). We move on to Ofiar Katynia street, where the former working-class residential estate, built for company foremen and ordinary workers, is located (west of the railway line). It has been designed according to the guidelines of the Military Residential Fund. The north-south linear arrangement of the blocks provided the estate with ventilation corridors and appropriate exposure to daylight. Interestingly, the first drafts of the design envisaged a different arrangement of the southern part of the estate. Finally, it has been given linear arrangement, too. The houses in the working-class residential estate shared a similar form and standard. Similar structures were given comparable internal layout: single- or double-room flats had a water closet, a washbasin, connected to the water-supply system. The heating and kitchen stoves were small, tiled, with bevelled edges. In the basements were common shower blocks and bathtubs, whereas some flats were fitted with boilers. There were pinewood parquet floors both in the rooms, the halls and the kitchens. Bathroom floors were covered with simple stone tiles. 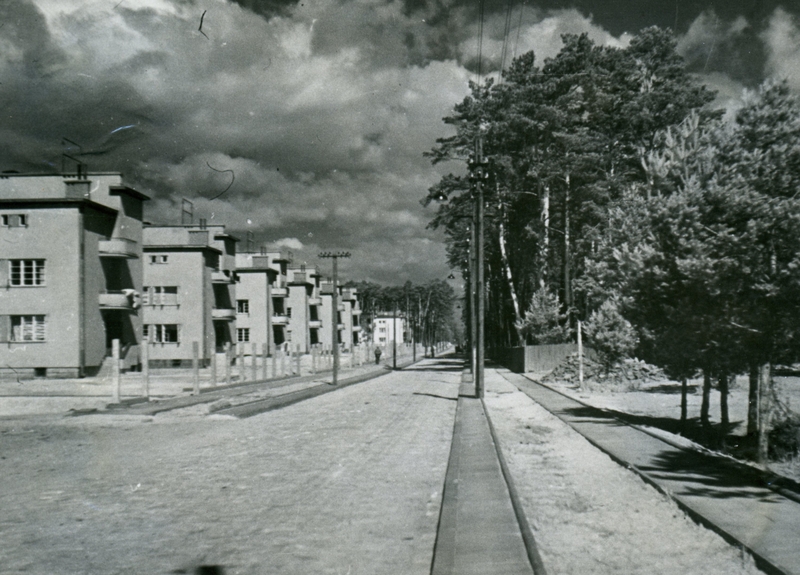 The houses built within the Central Industrial Region project, regardless of their prospective inhabitants, were provided with appropriate lighting, heating and ventilation systems – both functional and aesthetically pleasing. Looking at the details of the CIR architecture, we can see that the designers gave much thought to practical everyday solutions. Now, we are heading for the former Senior Management Building of the Southern Plant, and then to the Stalowa Wola Steelworks in Kwiatkowskiego street. The Southern Plant was given a rectangular layout, determined by the orthogonally arranged roads. On the premises, two technological lines were distinct: a smelting and a mechanical-processing one. An architectural showpiece of the company, the Senior Management Building stood out from other buildings. Nearby, the main entrance building was located, as well as the scales building. Other structure included a repair shop, a woodworking shop, a foundry, a wood warehouse and a garage. At a safe distance, there were oil tanks and the locomotive shed. The most important facilities were the production halls. There were sheet, plate and ingot mills, a wire drawing mill, an ingot warehouse, a steel warehouse, a steelworks with iron and scrap metal warehouses, and a water tower. Other facilities included a hardening shop, a forging shop and a laboratory. There were also a filter house, a substation, an electrical control house, a product acceptance facility and a treadmill. Also, use was made of the bank of the River San (located to the east of the centre of the complex), where a pump house and a biological station were built. A canal led from the pump house to the tank providing the plant with process water. An important task was to link the plant with the rest of the country. A national railway line was built, and numerous railway tracks were laid on the premises, to facilitate transport. It is worth emphasizing that the plans envisaged much extra space earmarked on the premises for possible extension of the whole complex. Thus, it was an open project, designed to accommodate future adaptations. The scale of the development was huge, whereas the structural and technological solutions implemented were both eye-catching and functional. The plant complex was created as an aesthetically uniformed architectural entity. The Senior Management Building was constructed in the years 1937–1938. 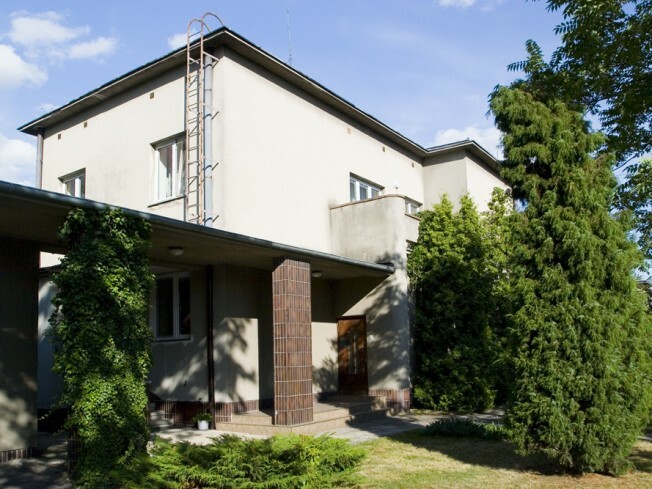 It was probably designed by Jan Bitny-Szlachta, the architect in Stalowa Wola. Enriched with Art Deco elements, it stood out against the architectural style of the works. It was given a modern look, conforming to the aesthetic canons of that time. A similar style was given to the Steelworks and Experimental Plant Management Building and the seat of the Mechanical Plant Management. The edifice was erected on a grand scale – its cubic capacity was 16,500 m3. It was given a very neat finish, reminiscent of the moderate Modernism with a touch of Classicism. The design of the building comprised two linked angular shapes based on an L-shaped floor plan. Its expressive effect has been obtained by moving forward one wing, decorated by regular pilasters with ceramic facing. This part is crowned with a Minimalist clock. The eye is caught by the layout of the entrance façade. Inspired by the Renaissance, the ground floor arcades are followed upstairs by French windows extending to the top of the first floor. The ground-floor windows have been fitted with external bars, with the motif of an eagle, which is the national emblem of Poland. To accentuate this charming appearance, the oblong main body of the building has been given rows of regular windows, separated by little pillars faced with clinker tiles. The interior of the building, also in the Art Deco style, was elegant and luxurious. The hall floor was marble, whereas the walls were made of granite panels, with chromium-plated strips fitted between them. The decorative pillar capitals were given not only noble stone facing, but also nickel-plated motifs alluding to the shape of the eagle. This motif was repeated in other interiors, as well as on the furniture inside the building. To bring out the appealing interior, appropriate wall lamps have been designed, combining nickel and glass. These elements are also found on the top floor of the building, where they constitute a perfect background to the then fashionable tubular furniture – the upper floor interiors, accessed by marble-faced stairs, have also been marked with the designer’s attention to detail. The reception rooms – such as the conference room, with an impressive coffered ceiling – are appropriately laid out and decorated. Indeed, the interiors have been given top-quality finish and lovely details. The functions and aesthetics of the interiors of the rooms were adjusted to the particular groups of users or guests – the most luxurious ones were for the VIPs. On the ground floor, apart from the hall and the porter’s lodge, there were a postal agency, the accounting department and the cashier’s offices. Upstairs were the general director’s office, the reception office, a conference room, a phone-making room, and – in the main section – particular department offices. The second floor comprised the offices for the constructors and technical staff. The archives, a dining room with a kitchen, and a shelter were located in the basement. Recently, the title to the building has been transferred to the Office of the Town of Stalowa Wola. Prospectively, it is to house the investor service and promotion offices, as well as other departments and their back offices. Now, we leave Kwiatkowskiego street for Hutnicza street, to reach the Route’s last site: another residential estate for the plant foremen and ordinary workers. It consists of 9 blocks of flats, each with three floors and two stairwells (5 of them in today’s Hutnicza street, and 4 in today’s Popiełuszki street). Each block contained 12 flats. Also, one 20-flat residential building has been built (today: 25 Popiełuszki street), with the flats accessed from a long corridor. Its distinguishing element was a prominent apse, reminiscent of naval architecture. Also, ground floor shops were made available here, just as in the Hotel No. 3 across the street (today, a police station). The flat design conformed to the guidelines of the Worker Housing Estate Society.